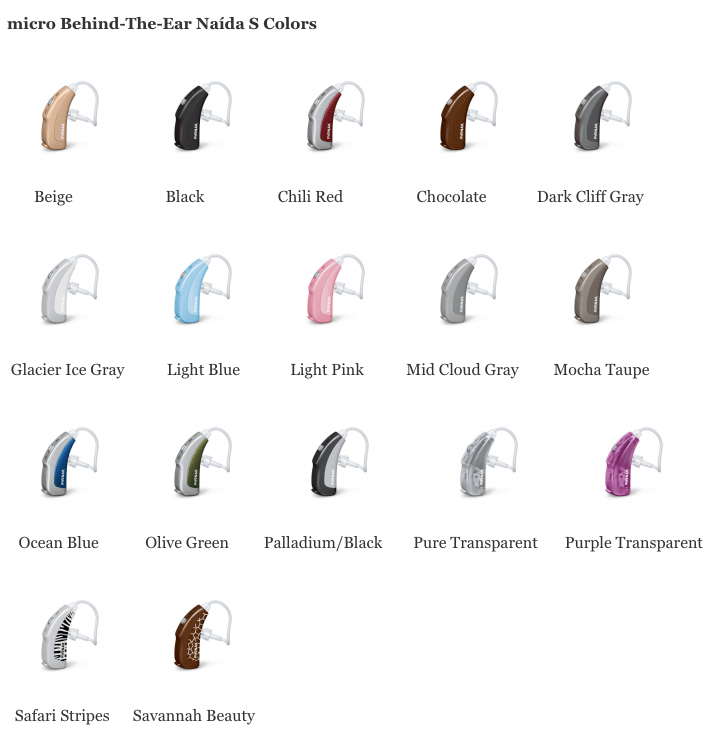 Updated November 4, 2016 – Phonak Naída S hearing systems are a water-resistant series of Phonak hearing aids that are dependably connectable Behind-The-Ear (BTE), and micro Behind-The-Ear (micro BTE) units designed to deliver exceptional hearing quality and clarity to individuals with moderate to profound hearing loss. This series also features pediatric solutions, helping bring hearing to young children. StereoZoom: A noise reduction technology that allows for easier, more comfortable hearing in noisy environments. This allows users to zoom in on the sounds they want to hear, while eliminating the ones they do not. UltraZoom: This advanced technology allows for easy hearing in noisy environments when the user is talking to multiple people. It automatically zooms in on the individuals’ voices in front of the user, while at the same time, reduces the sounds to the side, and behind the user. auto ZoomControl: This technology is ideal for hearing in environments when the user cannot directly face the person they are having a conversation with. This technology can zoom to either side of the user, or behind them, for improved hearing. This technology is especially useful while driving. FlexControl: This technology delivers personalized increases in volume and clarity. It allows users to quickly adapt to his or her environment, with the most comfortable hearing possible. FlexVolume: This technology allows the user to make precise volume adjustments to the hearing device, making sounds louder and softer, depending on his or her listening needs. SoundRecover: This increases the user’s awareness of his or her sound environment, while also increasing their listening pleasure. It delivers a fuller, broader spectrum of sounds to the user, allowing for a richer experience of voices, music, and nature. WhistleBlock Technology: This feedback-reducing technology allows users to experience enhanced hearing, without the annoying whistling that can occur in some other hearing aids. This technology makes talking on the phone a much more enjoyable experience for hearing aid wearers. DuoPhone: This advanced, wireless technology is excellent for phone conversations. With the simple push of a button, the hearing aid user can hear their phone conversation in both ears, for enhanced audibility, and easier hearing on the phone. SoundFlow: This technology automatically adjusts the hearing device’s program and volume settings depending on the user’s current environment. It allows for a seamless transition between multiple hearing situations. Real Ear Sound: By mimicking the way the ear naturally works, the Naída S hearing systems help users pinpoint the location of sounds much more easily. NoiseBlock: This allows for comfortable hearing in environments with a great deal of background noise by suppressing unwanted sounds like engines or fans, allowing users to focus on important sounds, like their conversations with friends and family. WindBlock: This feature allows for a more comfortable hearing experience while the user is outdoors. Loud, annoying sounds of wind that can become cumbersome are reduced substantially. EchoBlock: This technology lets users hear better, and more easily in echoey environments. SoundRelax: This feature reduces annoying and unwanted sounds, especially loud and unpleasant impulse sounds like clapping and crashing. Acoustically Optimized Venting: This feature is available in Phonak’s entire line of custom hearing aids, and BTE hearing ear pieces. QuickSync: This feature allows for easy and convenient program or volume adjustments of multiple hearing systems. When the volume or program of one hearing system is adjusted, the volume of the other is wirelessly, automatically adjusted as well. A water and dust-resistant BTE hearing system that is an ideal pediatric hearing solution, as it is smaller in size. Available in the Naída S CRT IX, Naída S CRT V, and Naída S CRT III. A powered model of the Naída S, designed to provide easier hearing to those with severe to profound hearing loss. Available in Naída S UP IX, Naída S UP V, and Naída S UP III. This model is designed to provide a hearing solution to those with moderately-severe to profound hearing loss. Available in Naída S SP IX, Naída S SP V, Naída S SP III. Naída S CRT: A water and dust-resistant BTE hearing system that is an ideal pediatric hearing solution, as it is smaller in size. Available in the Naída S CRT IX, Naída S CRT V, and Naída S CRT III. Naída S Ultra Power (UP): A powered model of the Naída S, designed to provide easier hearing to those with severe to profound hearing loss. Available in Naída S UP IX, Naída S UP V, and Naída S UP III. Naída S Super Power (SP): This model is designed to provide a hearing solution to those with moderately-severe to profound hearing loss. Available in Naída S SP IX, Naída S SP V, Naída S SP III. Phonak ComPilot: This device allows for convenient, wireless adjustment of the user’s hearing system, including VoiceAlerts of the hearing aid’s status. This delivers wireless hearing access of the user’s television, MP3 player, phones, and other electronics. It features a built-in remote to deliver easy volume and program changes. Phonak TVLink S: This dedicated television solution provides the user with almost instantaneous transmission of a television’s audio directly to the user’s hearing device. Additionally, it transmits in stereo sound, so it can be heard clearly in both ears. Phonak PilotOne: A user-friendly, essential remote that provides users with discreet control of their hearing device. Its simplistic design delivers quick and convenient volume and program changes to the user’s hearing device. myPilot: This remote control features a color LCD that provides users with easy access to numerous functions, including their hearing aid status information. The remote also features separate left and right adjustments. It also saves important volume and program settings that can be recalled quickly and easily from the device. iCom: The communication interface between the user’s hearing system, and his or her electronic devices, including televisions, telephones, MP3 players, and more. SmartLink+: This Dynamic FM transmitter has been designed for teenagers as well as adults. With 3 microphone modes (SuperZoom, Zoom, Omni), the user can increase hearing ability depending on or her needs. Since it is compatible with Bluetooth technology, the device also allows users to control his or her hearing device wirelessly. ZoomLink+: A Dynamic FM transmitter designed for teenagers and adults that features 3 microphone modes, as well as an audio input, and SoftLanding technology, which allows sound to be transmitted directly to the user’s ears, providing the user with enhanced hearing. EasyLink+: This easy-to-use Dynamic FM transmitter designed for teenagers and adults features a single microphone mode that can be configured by the user’s hearing professional. It helps make conversations easier to follow. inspiro: A Dynamic FM transmitter that is designed for use by teachers in regular, as well as special schools. This helps transmit the teacher’s voice directly to the hearing systems of those wearing a hearing device. ML10i: A design-integrated Dynamic FM receiver that is designed for the Naída S UP. ML11i: A design-integrated Dynamic FM receiver that is designed for the Naída S SP. ML15i: A design-integrated Dynamic FM receiver designed for the Naída S CRT. 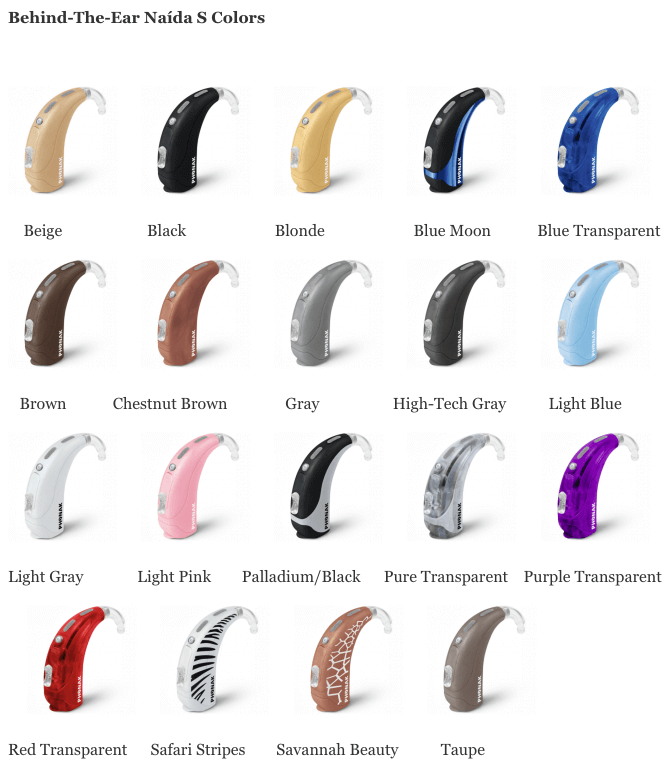 The Naída S Essential (I) provides users with WhistleBlock technology, as well as a water-resistant design to protect the hearing device from dust, sand, sweat, and humidity.